If you’re not sure why you’re not getting new students, the sales funnel might be just the diagnostic tool you need. It can show us a lot, including how we can improve our processes to get more students. The sales funnel is the path people follow to become customers. At the top of the funnel we have every person who has encountered our business. At the bottom, we have those who have enrolled as students. In between, we have all the steps of the sales process. The top of the funnel captures all the people who come to our website to investigate lessons. Every one of these is a prospect. As we work through the funnel, prospects drop off for various reasons until we get to the bottom, where the only people left are prospects who become students. I believe, no matter what stage our businesses are in, it’s worth paying attention to this funnel. It shows us where we might be losing potential customers and helps us be more strategic and efficient. Let’s say your website gets 100 visitors to the “prospective students” page in a month and ten of those hits turn into inquiries. That’s a 10% conversion rate. Of those ten calls, six schedule intro meetings, two aren’t ready to take the next step, one never responds to your follow-up attempts, and one called for lessons in an instrument you don’t offer. Now we’re converting 6% of website visitors. Of those six who scheduled intro meetings, five follow through and one cancels. Of the five who attend, one decides to go with a different teacher, and four enroll in lessons. In the end, we have successfully converted 4% of website visitors (or 40% of inquiries) into students. This sales funnel gives us a benchmark for our current conversion rates and a picture of where we’re operating inefficiently and losing potential students. These insights can help us set helpful and measurable goals. A teacher with a full studio, who is feeling overwhelmed by admin work, may look at it and determine she’s wasting too much time talking to non-serious students on the phone. From this data, we may deduce that she needs to tweak the messaging on her website to answer preliminary questions so she doesn’t have to field as many phone calls. A teacher who wants more students may look at the same data and determine that he needs to improve his on-phone salesmanship so more of the students he talks to on the phone come in for an intro meeting. Neither reaction to the data is wrong. The way we apply it is influenced by what we want to accomplish. The first step is to figure out the levels of your sales funnel. I think the website is an important piece to this puzzle, so I start tracking from there. Others might start at the inquiry level. As inquiries from students roll in, keep track of all of them in a spreadsheet or on paper and pay attention the points where prospects drop out of the funnel. Make a regular appointment with yourself to evaluate the progress of prospects through the funnel and see where improvements can be made. Make one change at a time and compare your conversion rates from the previous month. 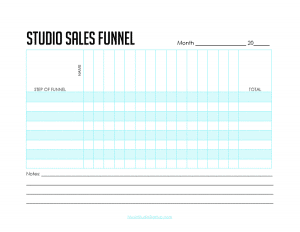 I’ve put together a Sales Funnel Worksheet to help you do this in your own studio. Success! The studio sales funnel worksheet is being delivered to your inbox as you read. If you’re not sure how to change your studio practices to get the conversion rates you want, consider scheduling a complimentary mini session and I can share some pointers about your specific situation.